The follow-up sequel to Jack Reacher (2012), Jack Reacher: Never Go Back (2016) is almost a warning to the audience in the title alone. I understand how a long-running book series like the Jack Reacher series by Lee Child is advantageous for the author by allowing the reader to pick up any book in the series and not need the background of the previous titles. However, with these self-encapsulated scenarios, Jack Reacher is probably better aligned with a television series than a series of movies. Not everyone can be the James Bond series, which has been able to get away with this for as long as it has. Don’t get me wrong, I liked the original Jack Reacher movie, as it seemed to channel the “man with no name” / high-plains drifter / Ronin style that was prevalent in Westerns and Samurai films. His skills and calm demeanor unquestionably imply military training, but now that Never Go Back has returned them to those roots, it feels less impactful. Sure, there’s still the requisite fight sequences and car chases, but they just feel like the standard checklist trappings of an action film instead of an exceptional experience. Having read the first book in the Jack Reacher series, I also have some problems with how the movie’s portrayal of the main character. The first movie did OK in creating this mythical man who always seemed to know what to do and where to go (somewhat along the lines of John Wick (2014)). This movie seemed to add in so many side plots and distractions that I never quite knew what Reacher (Tom Cruise) was going to handle next. Perhaps the dissociation between the book and movie versions of the character also has to do with trying to maintain a PG-13 rating for a character who clearly does R-rated things. 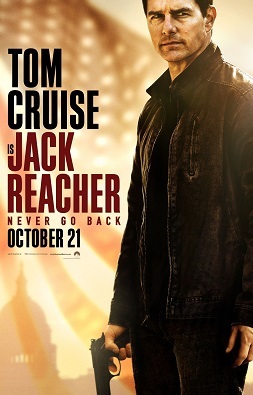 A film series that I will not likely return to, I give Jack Reacher: Never Go Back 2.5 stars out of 5.